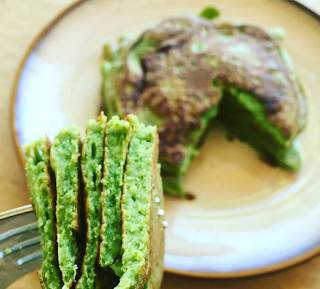 Fit Fluential Mom: Spinach Protein Pancakes: Kid Friendly, Mother Approved! Spinach Protein Pancakes: Kid Friendly, Mother Approved! Another version of super easy protein pancakes that the kiddos can eat too if you use a kid friendly protein/nutritional shake (aka Shakeology). Just in time for weekend family breakfasts! And promise you won't even taste the spinach! 1. Play with the consistency to make them thicker, thinner, etc. Add more Shakeo to make it thicker or a splash of milk (cow, coconut or almond) to make it thinner. 2. Make as you would regular pancakes in a skillet or griddle with coconut oil.